Rated 5 out of 5 by cyndrap from Fun, interesting, keeps one engaged I have to agree with the other reviewers of this game. Very fun, interesting story line, and good graphics. Interesting types of games not just the standard match 3. There was a typo in the start of the game, everyone was coping with a huge tornado except for the professor flying the balloon he was telling us he was in a hurricane. No biggie but odd. The music was terrible so just muted the sound. I liked this game and after playing the demo, bought it. Rated 5 out of 5 by puglette404 from It's a PUG!!! It's a pug!!! I would buy this game just for the pug!!! Rated 5 out of 5 by biscuitsmama from A MATCH 3 GAME WITH A LOT OF VARIETY Storm Chasers Tornado Islands is an excellent Match 3/Combo type game. There are so many match 3 games to choose from but, IMHO, this is one of the best of the best. The storyline is well told and I found myself waiting for the “next chapter” as I played through the game. The mechanics of the game include the obvious matching 3 tiles to make them disappear but there is much more. We encounter obstacles and different goals with each level. There are tasks that include clearing the board and then specific additional tasks or goal to acquire resources. Once we have resources we are then able to rebuild the village so that we can find our way back home. There are various mini-games or HO scenes mixed in with the match 3 boards to help break up the basic matching of tiles. The graphics are crystal clear and full of gorgeous color. 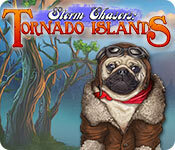 Overall Storm Chasers Tornado Islands is a game that I highly recommend. It is suitable for all ages from the younger crowd to those of us who are young at heart. This is a great game to fill out my gaming library and a go to game for when I am no playing a HOPA game. Please try the demo to see if this is a gam e you will enjoy as well. Happy gaming! Rated 5 out of 5 by twtscat48 from Awesome Match 3 I loved this game, I am a match 3 fanatic and this one is great. 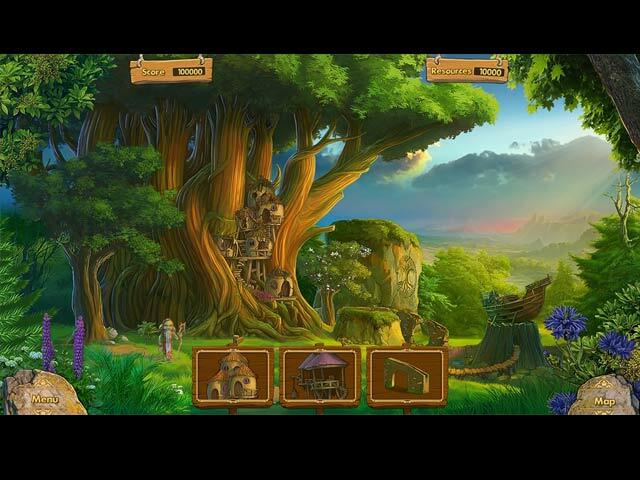 There is different games throughout which gives you a variety in between the typical match 3. The graphics were fantastic, I purchased this game after the went through the demo. I definitely recommend this game!!! Rated 5 out of 5 by gilly85 from Quality Match 3 What a variety of games within this match 3 gem. I've only played the demo and hate reviews on just the demo but this game is so good. 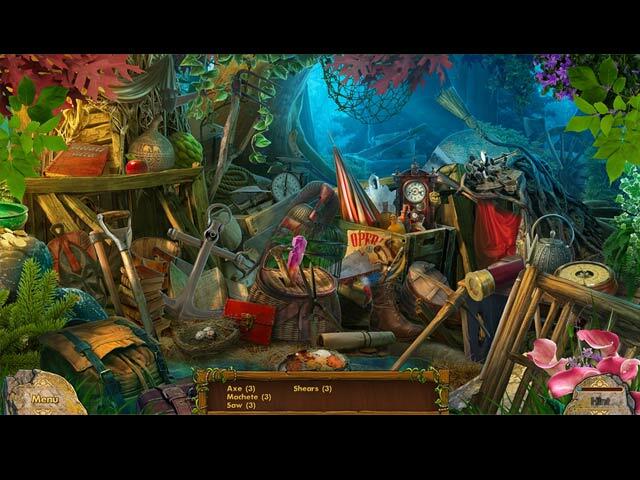 Match 3, Hidden object, resource collecting,puzzles and a great storyline. Choice of timed or relaxed. The graphics are so excellent I could almost eat the fruit and the sound effects of the bees and the forest sounds had me believing I was outside. I've never had to drop bombs from the bottom before to collect them but with many in-game bombs they are (at the moment) unnecessary. This is a BUY for me. Well done Big Fish for finding this one..., and to Floating Cat the devs.to watch for I think. Rated 4 out of 5 by Kafinkee from Good Family Fun I don't think this game would be easy enough for very young children but should appeal to everyone else in the family that enjoys match 3 games. You need to keep a watchful eye on the game board -- for instance, when vines are involved, you'd normally expect that once you destroyed them all that would be it but they pop up again and again anywhere on the board. I chose relaxed mode to begin with (timed mode is also available) and didn't see any way to change that once I started playing. Game play was smooth, no waiting for tiles to finish falling before making another match which is a must for me when considering whether or not to purchase. Not a lot is unique compared to other M3s but there are some interesting little twists. I had plenty of fun playing the demo and will be buying this game so I can finish what I started (relaxed play) and then I'll try my hand with the timed version. If you're also a fan of M3 games, I highly recommend that you give this demo a try. Rated 4 out of 5 by twinsoniclab from A Fun and Well Made Match-3 A nice Match-3 game! Basic game play, with frequent side games/puzzles. Also, after a few boards you will be gathering resources to help rebuild the village destroyed in the storm. The builder part doesn't overtake the Match-3, as in some games, so I didn't mind it. I like the side puzzles, although, really, for a Match-3 game they needed come so often. Play timed or relaxed. You CAN make matches while tiles are still in motions, a big "need to" for me. There may be impediment tiles, such as ivy that needs to be removed by matching near it, but it grows back and spreads. Your objectives are shown at the top of the board. Some boards will have several objectives, which is shown by how many small circles are under the large bubble. For puzzles there are quite a few different types. HOS, light all the buttons when pressing one lights others, untangle vines by clicking them from the topmost down... nothing mind boggling, but fun. There IS a story and it interrupts the game play a bit too much for my taste, but at least there is a story and it's told! A solid game with much to recommend it, so I will. Rated 4 out of 5 by pennmom36 from BLOWING IN THE WIND The Storm Chasers Alex, Professor Finch, and faithful Pug Muffin may have bumped their heads a little too hard when they crash-landed while chasing a wicked storm. Professor Finch is still mia, but Alex and Muffin have discovered a parallel world, a Cloud Island of magical creatures. The storm has destroyed their village so they cannot help the "wind-walkers" return home until the Elder's Hut has been restored, and of course, that will require collecting resources by playing Match 3 games. I actually wasn't expecting much when I downloaded this game, but it turned out to be a pretty decent fantasy-themed Match 3 game with Puzzles, Mahjong games, and Hidden Object Scenes with Silhouetted Shape finds, Multiple Item finds and Listed Item find variations. The troll creatures are adorable and the Match 3 levels have great layouts, unusual obstacles, and good bonus features. You can play in a Relaxed or Timed Mode, and you will either earn a Gold Star or no Gold Star for completing the level goals on the Timed Mode, but any level can be replayed. As you progress, you unlock Challenge Levels of Match 3 games and Mahjong games. The Level Goals require you to fill the Glass Ball at the top by making matches of each resource shown inside the ball, including making matches on all highlighted cells (blue tiles require a single match, green tiles require two matches) You will need to keep an eye on the Ball so to speak, because once you fill the ball, the resource will change to the next item. The Obstacles are rather unique, Ivy grows on some of the cells and will continue to grow over the entire board if you don't make an adjacent match. Cobwebs cover tiles and require a match made of whichever tile is covered, which I'll admit made it difficult to see which resource was covered at times. When you make large matches, you will earn a bonus on the board, depending on which direction the match was made, you'll get a vertical or horizontal line buster, if you make a match of tiles both vertically and horizontally in one match, you'll get a Cross line buster to destroy tiles vertically and horizontally. Bombs are eventually earned that can be used whenever and wherever you want and can be recharged once the Elder's Hut has been built. If you don't have any portable bonuses for a while, explosion bombs will appear on the board and can be collected by dropping it off the bottom of the board. 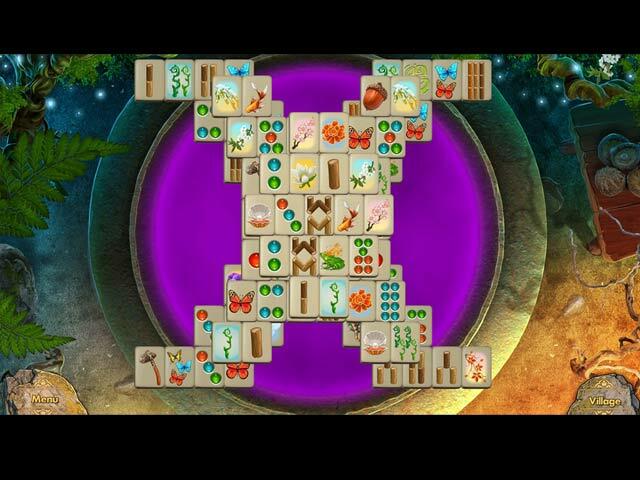 After a few Match 3 Levels, you get to play a puzzle of some type such as removing vines by selecting the outermost vine until they have been removed. There are Mahjong games and Hidden Object Scenes that vary in types such as Silhouetted Shapes or Listed Item finds. Enjoy! Rated 3 out of 5 by Innovativemom from The Game Pushed & I Uninstalled The game starts out great but about half way through the demo I started getting bored. There was not as much variety as I was expecting after reading all the reviews, so I was a little disappointed there. What really made my decision was when the match 3 game kept pointing out matches. This is a big pet peeve of mine. If I had lingered there for a while then it would have been understandable but I hadn't. I don't like to be pushed along by the game as a default. I like to play the game myself, my way, & in my time. Rated 2 out of 5 by Pandashie from RELAXED Mode? Hard to relax with creeping obstacles! If they are not removed sufficiently fast they obstruct more of the board. How is it possible to concentrate on accumulating the required goal tiles when fighting active obstacles?! Rated 2 out of 5 by bessiegirl from yawn Something awkward and clunky about this game. I could not even make it through the demo without feeling I was going to nod off. Takes several levels before you can start building anything and then that is even confusing. WAY TOO MUCH dialog. Good grief. Seems to have an array of different HOS, etc to break the monotony of the match 3 part, but even those can't take away how slow and clumsy the match 3 is. Basically, I would not even waste a credit on this unless I needed to keep it from expiring. I love match 3 and they are few and far between, but there are better ones out there than this one.